A second quarter report of existing-home sales showed healthy gains from the first quarter, and price declines have increased affordability, according to the latest survey by the National Association of Realtors®. Lawrence Yun, NAR chief economist, said the sales gain appears to be sustainable. “With low interest rates, lower home prices and a first-time buyer tax credit, we’ve been seeing healthy increases in home sales, which are a hopeful sign for the economy,” he said. What is happening in our local South Central Vermont real estate market? Let’s take a look at statistics for the past six months for Rutland County, Windham County and Windsor County. With South Central Vermont real estate sales following the national upward trend, now is the time to buy. As you can see, an increase sales is followed by an increase in prices. Buy now for the best possible deal on South Central Vermont real estate. As part of the annual Swanepoel TRENDS Report that is published every year during the first week of February, the research team wraps their four month study of the real estate industry by announcing the top 10 Newsmakers, Events and Trendsetters for the year. The second list to be released is the top 10 events that during 2008 had the largest impact and influence on the real estate brokerage industry. Events are defined as those occurrences that transpired during the previous calendar year (2008) that made headlines and captured the attention of the real estate industry. The selection of these events was based upon their potential future impact on the industry rather than only their 2008 impact. Most notably the one single event of the year was the announcement of the “Silver Bullet” designed to save the country from the subprime collapse itself and the failure/buyout of major Wall Street firms and national banks. Depending upon how effectively the Emergency Economic Stabilization Act’s $700 billion is going to be allocated and managed it may prove to be the beginning of the turning point in the current economic recession. In one of the most competitive, contentious, divisive and yet historic political campaigns the country responded with the largest voter turnout in history to elect an African American, Barak Obama as president. The “I have a dream” has taken a huge step toward fulfillment. However, the new administration will have little time to reflect on victory as it faces serious economic challenges and a trillion dollar plus debt that will take years to resolve. Barely one year ago in 2007 these companies were not only household names but were considered financial giants. In one short year they have become a factoid of history. Some filed for bankruptcy while others were acquired by the likes of Bank of America, the federal government, J.P. Morgan Chase and Wells Fargo. 2008 reminded us that nothing lasts forever and everything is replaceable. As a direct fallout of the subprime collapse, the foreclosure rate in the U.S. hit staggering levels in 2008. At the opening of the third quarter foreclosures were up 25% over the previous October with a reported one in every 452 of the country’s homes in foreclosure. RealtyTrac reported last October that there was a sharp decline in foreclosure filings but it still estimated that by the end of 2008 there would be more than one million REOs on the books. The recession devastated many real estate markets across the country with the worst-performing towns and cities in places like central California, Miami and Las Vegas posting declines of 40% in 2008. The stranglehold on financing continued to drive home prices in many other places back to 2000 – 2002 levels, with predictions of continued declines in 2009 as unemployment reaches record highs and the financial meltdown spills over to other industries. Finally the long and protracted 2½ year legal battle between NAR and the Department of Justice (DOJ) was put to rest as Judge Kennelly issued his final judgment in November. In the end, NAR’s longstanding Internet Data Exchange (IDX) policy was validated as NAR was deemed to have not admitted any liability or wrongdoing and no payments were made in conjunction with the settlement. In addition, NAR has been cleared to reinstate an updated version of its Virtual Office Website (VOW) and the MLS has been preserved and strengthened in the process. Now it’s back to business. Changing names, merging, consolidating, filing bankruptcy and closing branches was on the order of the day throughout 2008 as literally thousands of real estate brokerages companies went out of business during 2008. This included many independents as well as franchises from just about every major brand including Century 21, EXIT and RE/MAX. Also filling for bankruptcy is national franchise Help-U-Sell and Web 2.0 newcomers such as Igglo. 2009 may see even more brokers closing up shop than 2008. 8. Keeping It ShortFounded in 2006, Twitter moved into the mainstream this year as the next evolution in the social networking and micro-blogging environment. By using short text-based posts (affectionately named “tweets”), staying in touch has been given a whole new meaning. As we discussed in last year’s report (Trend #1 – Two Worlds; One Industry) ActiveRain has moved to the head of the social networking line in the real estate industry. With as many as 35,000 users logged on at the same time, no one else has even come close to reaching that many Realtors® at one time. It goes without saying that ActiveRain has proven that social networking has made a home in real estate. In May 1908, 120 men gathered in Chicago with the goal to “unite the real estate men of America.” Today the National Association of REALTORS® (NAR) is America’s largest trade association representing more than 1.2 million members. For 100 years, NAR and its members have established homeownership as a cornerstone of the American Dream and advocated private property rights as one of the fundamental principles that unite us as Americans. 2008 marked NAR’s centennial birthday. How many of these events impacted you or were/are you aware of? Learn more about Ludlow real estate by visiting ISellVermontRealEstate.com. 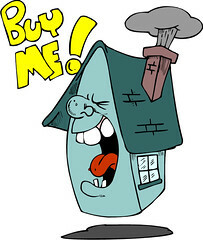 Search all Ludlow real estate and homes for sale. For updates on Ludlow real estate market, visit my website or give me a call at 800-659-1819 #103. The National Association Of Realtors predictions that the housing market will remain on a high plateau (see previous post) is holding true for Central/Southern Vermont. The March real estate sales report is in and though March 2006 is not quite what March 2005 was, the market remains strong. The number of New Listings for March 2006 is down by 17% from the March 2005 numbers. 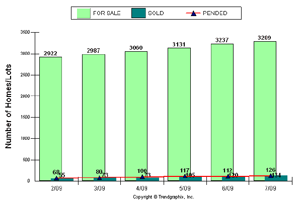 The Sold Listings in March 2006, however, are up 67% over the same time period in 2005. The Average Sales Price is also up by 5%. What does this mean for Vermont buyers and sellers? For buyers, it means there is less inventory or less homes to choose from. There is stiff competition among buyers for the good properties. This is a market that you want to have an experienced Realtor representing you who knows the nuances of a competitive market. For sellers, it means you need the advice and counsel of a Realtor who is knowledgeable and the has experience needed help you price your home neither too high or nor too low. I have earned my CRS (Certified Residential Specialist) designation. This is the highest designation in the real estate industry. The CRS is held by only 2% of all real estate agents nation-wide. This designation is held by the best! So choose the best to represent you in your next real estate transaction. Give me a call, 802-226-8022. Don’t settle for anything less! NAR President Thomas M. Stevens from Vienna, Va., said home prices are expected to cool, but not as much as in earlier projections.